Collin Kern (‘20) won the competition with his lip-sync routine to “Oops!... I Did It Again” by Britney Spears. In celebration of Homecoming week, SAC Homecoming held its annual Open Mic Night on Oct. 24 in Marty’s. Students, staff, and faculty gathered in Marty’s to enjoy the show and share talents of their own. Top Banana President Annika Peterson (‘19) and Top Banana member Gibby Swalley (‘22) emceed the event. The comedic duo introduced the performances and added comedic bits in between them. The night started with an Orchesis dance routine, followed by a stand-up comedy routine by Matthew Raihala (‘21). This event was a relaxing chance for audience member Abbe Lacey (‘22) to enjoy the talents of her peers in good company. Next, Laura Elmquist (‘22) took the stage and sang “Burn” from Hamilton. Elmquist signed up the night before and had mixed feelings before the performance. In addition to the performances, SAC Homecoming did raffle drawings throughout the night. 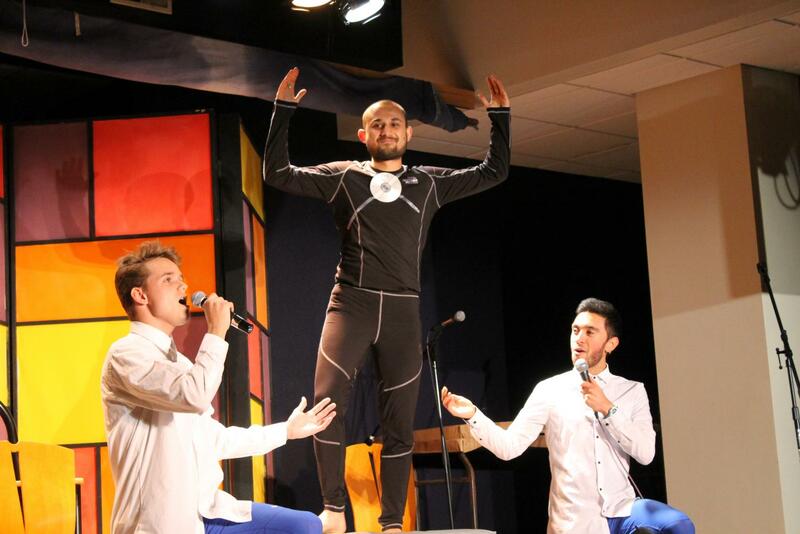 [LEFT TO RIGHT] Alex Streitz (‘19), Rupak Bhatt (‘20), and Stefan Hankerson (‘19) performed a routine that combined singing and dancing during SAC Homecoming’s Open Mic Night. After a brief intermission Alex Streitz (‘19), Rupak Bhatt (‘20), and Stefan Hankerson (‘19) took the stage to showcase their talents. The trio performed a song by comedians Tim and Eric called “A Song for Dee Vee” from their Chrimbus special. Streitz and Hankerson lip-synced and serenaded Bhatt as he danced between the two. Following the trend, Collin Kern (‘20) had his own lip-sync performance to share. Starting off in a trench coat, Kern began to lip-sync to Britney Spears’s “Oops!… I Did It Again.” Kern engaged directly with the audience and used every part of the stage to perform. While lip-synching, Kern took off his trench coat. 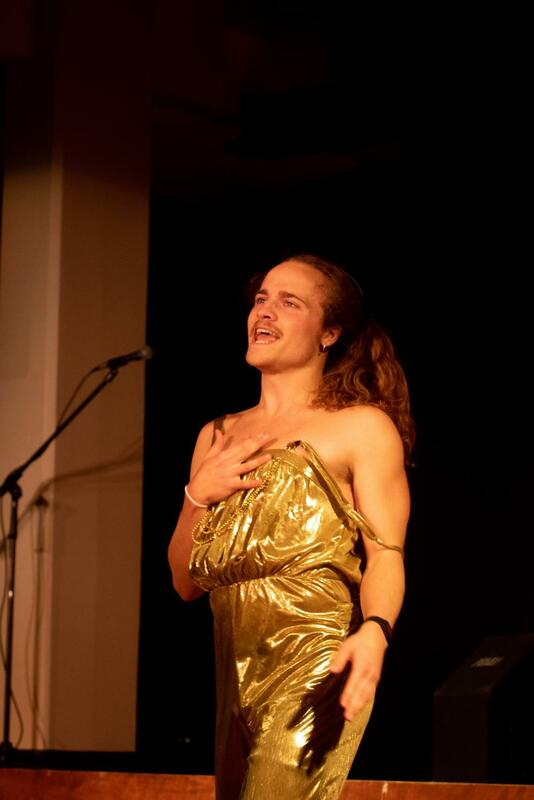 By the end of the performance, Kern was wearing a gold jumpsuit and had a puppet at his side. This is not Kern’s first time performing a piece like this. Not only did he showcase a similar talent at Open Mic Night last year, but he has also lip-synced several other times in the past. Afterward, Christopher Lange-Pearson (‘19) sang “Wait and Bleed” by Slipknot. Next, Alex Laskowski (‘22) performed with his violin. Laskowski recorded part of his performance and looped the piece, with the final product being a complete and original work. 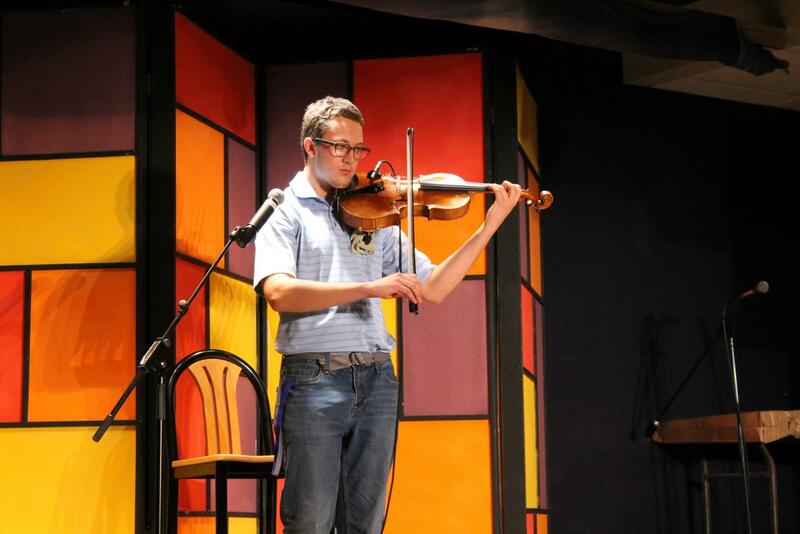 Alex Laskowski (‘22) played his violin and looped motifs to create a completely original song. After all of the performances were done, judges Professor of Biology Scott Carlson, Visiting Assistant Professor of Chemistry Ben Tokheim, and Interim Farwell Area Coordinator Kjerstin Nelson (‘18) crowned Kern the winner of the night. According to SAC Homecoming co-chair member Maya Evans (‘19), a lot of effort goes into preparing for this event, as well as the rest of the Homecoming events. “Even though Homecoming week is busy and can be stressful, it is extremely fun and rewarding to see the events we planned come to life,” Evans said.